Four institutions have been awarded $53.6 million in funding over five years by the NIH’s National Cancer Institute (NCI) toward a national effort to expand the reach of cancer immunotherapy to benefit more patients. 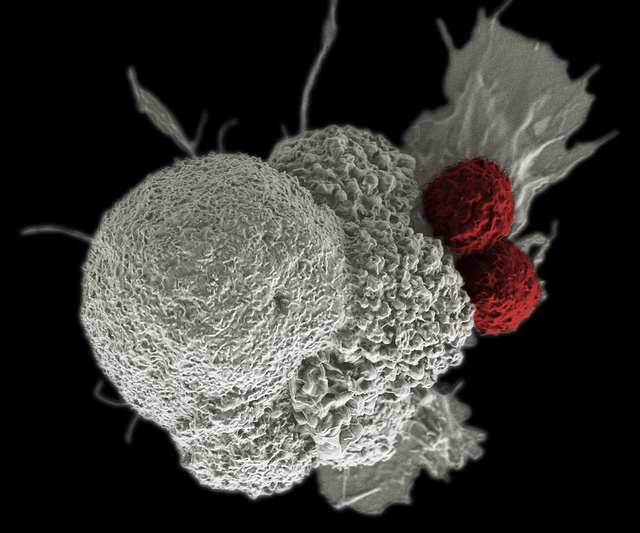 The NCI has awarded cooperative agreements to support four Cancer Immune Monitoring and Analysis Centers (CIMACs) designed to focus on systematic collection, processing and analysis of blood and tumor samples, as well as immune monitoring, for adult and pediatric immunotherapy clinical trials. The four CIMACs have been awarded to Stanford (CA) Cancer Institute; Precision Immunology Institute and the Tisch Cancer Institute at Icahn School of Medicine at Mount Sinai, New York; University of Texas MD Anderson Cancer Center in Houston; and Dana-Farber Cancer Institute in Boston. Dana-Farber has also been awarded an NCI-supported Cancer Immunologic Data Commons (CIDC), which will collect the resulting data for exploration of biomarkers of immune response. The CIMACs and CIDC are expected to serve as a foundation for the core laboratory, assay development and database functions required by the Partnership for Accelerating Cancer Therapies (PACT), launched today by the NIH and 11 biopharmaceutical companies. PACT is a five-year, $215-million public-private research collaboration with an initial focus on identifying, developing, and validating biomarkers to guide and improve treatments that help the immune system attack cancer. PACT will be managed by the Foundation for the National Institutes of Health (FNIH), with the FDA serving in an advisory role. Through FNIH, the 11 biopharma partner organizations will contribute up to $1 million per year for five years—a total $55 million in private-sector funding—while NIH will contribute $160 million over the five years of the partnership, subject to availability of funds. “We want to improve immune monitoring to better understand the mechanisms that lead tumors to respond to or resist treatment so we can develop new, better strategies for patients,” Ignacio Wistuba, M.D., chair of Translational Molecular Pathology and principal investigator of the CIMAC at MD Anderson, said in a separate statement. MD Anderson said its CIMAC will receive $11 million over five years and will connect mainly with clinical trials conducted by two of the NCI’s cooperative groups, multi-institutional networks that conduct major clinical trials of new cancer drugs. Dr. Wistuba is among co-principal investigators for MD Anderson’s CIMAC, along with Elizabeth Mittendorf, M.D., Ph.D., professor of breast surgical oncology, and Chantale Bernatchez, Ph.D., assistant professor of melanoma medical oncology. APOLLO was created to systematically compile clinical and research data, and guide the collection, processing and deep molecular and immune analysis of biopsies and blood samples before, during and after treatment to learn as much as possible from each patient. APOLLO is co-led by Dr. Wistuba and Andrew Futreal, Ph.D., a platform leader for genomics and informatics for Anderson’s Moon Shots program. PACT was created as part of the Cancer Moonshot initiative launched last year by President Barack Obama and Vice President Joe Biden. The Moonshot is being funded with $1.8 billion through the 21st Century Cures Act, enacted in December 2016 following overwhelming approval by both houses of Congress.